Until this week, I’d never even heard of a cornmeal biscuit, but I saw a recipe in a magazine and had to give it a try. It seemed like the perfect bread to go with a dinner of barbecued chicken. What’s special about this recipe, inspired by one from an issue of Cook’s Country, is that the cornmeal is soaked for 10 minutes in buttermilk. What you get is a biscuit that’s packed with corn flavor but isn’t too grainy. Also, they weren’t sweet, which is probably a good thing if you’re serving them with dinner, but if you still want sweet you can serve a little honey on the side. This recipe says to knead the dough, which is interesting since kneading dough forms the glutens which can make biscuits tough. But the original recipe noted (and I appreciated that note!) that this dough can be kneaded because a good deal of it is cornmeal (which is gluten-free) and the acid in the buttermilk inhibits gluten formation. I still felt weird kneading biscuit dough, but the biscuits were very tender in the end. Mine spread a little more than I’d anticipated, but it wasn’t a big issue. I used about 4.5 oz of flour per cup and might use up to 5 the next time for more squared off looking biscuits. Then again, we loved them this way so I can’t complain. Below is the recipe for hte cornmeal biscuits I made. Since we loved them so much, I’ve bookmarked a few others including Julie’s (adapted from Cooking Light) and a highly rated one from Food TV. It will be fun to compare them all. Preheat oven to 450 degrees F. Line a baking sheet with two layers of parchment paper. In a large mixing bowl, combine the cornmeal, buttermilk and honey. Stir well and let sit for 10 minutes to soak the cornmeal. Add flour, baking powder, baking soda and salt to a food processor and pulse to mix. Add cold butter and pulse until mixture is coarse. Pour the flour mixture into the buttermilk mixture and stir to make a soft dough. Turn out onto a lightly floured surface and knead about 8 times until smooth. Using a biscuit cutter or the top of a glass about 2 inches wide dipped in flour (I dip mine in a little water), cut out 6 rounds. Arrange rounds on cookie sheet. Bake at 450 for 5 minutes or until biscuits really start to rise in the oven, then turn heat down to 400 and bake for another 12-15 minutes or until golden brown. I have never made biscuits! 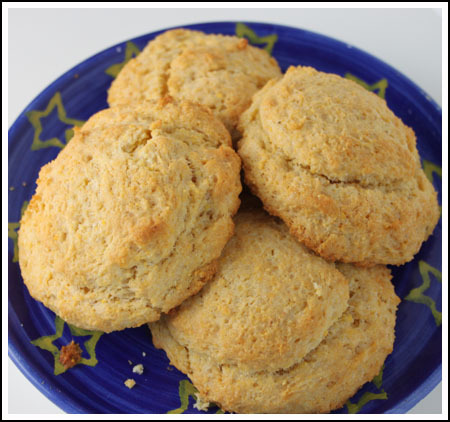 I feel they’re a little dauting…maybe these cornmeal biscuits are a little easier than regular ones? caise you cant overmix them right? Maybe this is a good starting point for biscuits! Tried these last night. They were great! These look delicious! and I have buttermilk in my fridge! Cornmeal? Check. Biscuits? Double Check. These are an epic win! Cornmeal muffins, yes. Cornmeal biscuits? Wow. I love the idea, Anna! If you try the cornmeal biscuits from CL, you’ll be able to tell they do not have lots of butter, but I think the texture is still great. Not flaky, but soft inside with a crisp shell. I think the poppy and sesame seeds are musts, even though it’s a little extra effort. Hope you like! I make these over and over and they never disappoint. Susan, thanks for the info! I never knew where the name “shortening” came from. I was a little cautious about kneading biscuit dough since all my life I’ve been told to use a light hand, but I’ll try kneading them a little more next time to see if I can get a sturdier biscuit. These look like such a great biscuit… perfect for these cooler soup months coming up. These sound great – I bet they’d go well with chili! The fat inhibits gluten formation as well. Fat is referred to as shortening because it shortens the strands of gluten. Your biscuits may spread less if you knead them a little more. Water promotes gluten formation – so, despite the fat in pie crust, it can toughen with too much handling. If you have cookies that are a little crumbly but you’d like to make them sturdier for mailing, you can tweak the recipe by adding a little water to make them “stronger”. I’ve never had a cornmeal biscuit! These look like they would be great with soup or chili. Thanks! i am certainly going to try these. my 20 month old loves homemade cornbread & i bet he’ll just eat this up. thanks! What a great idea, we’re eating a lot of salads now and this is the perfect accompaniment, thank you! I make Cuban Corn Bread from Douglas Rodriguez’s Nuevo Latino cookbook. It has corn kernels and cornmeal which get cooked about 10 minutes. Then a starter of yeast, honey, and flour gets added. It rises 3 or 4 hours then gets kneaded. It’s totally unlike a “quick” bread as it has a crusty top but a soft interior. I’ll send it to you if you like. Ginny, sure! I’m in the habit of baking with unsalted butter these days, but if I were using salted I would go ahead and eliminate the salt. Thanks for asking. Couldn’t I just use regular salted butter & eliminate the salt called for? I love trying new biscuit recipes. This looks like a good find! I wonder if you put them in an 8×8 pan like the Touch of Grace biscuits if they would raise instead of spreading. I have to try these ,they sound like they would be good with a bowl of Chili. Thanks for sharing !